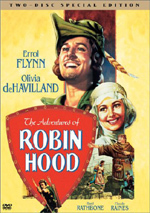 Errol Flynn is eternally charming as Robin, defender of the poor, in this rousing family adventure that co-stars Olivia de Havill and and Claude Rains. For years 1938’s The Adventures of Robin Hood has stood as a seminal work. Not only does it continue to display society’s general concept of Robin Hood as a character, but also it presents the archetypal notion of the action movie. Today’s efforts in that genre may be bigger, more expensive, and more rapidly edited, but they don’t show much that didn’t already appear in Adventures. Set in 1191, a preface tells us that Leopold of Austria captured King Richard the Lion-Heart (Ian Hunter) during his return from the Crusades. Prince John (Claude Rains) wants to take advantage of this, so along with his right-hand man Sir Guy of Gisbourne (Basil Rathbone), he oppresses and taxes all the Saxons badly to set up his power base. One Saxon - Sir Robin of Locksley (Errol Flynn) – doesn’t care for this treatment, so he proclaims that he plans to fight the power. Robin crashes a party at Sir Guy’s place and declares his intentions to all involved. At this gathering, he meets Lady Marian (Olivia de Havilland). She immediately seems to dislike the brigand, and some sparks fly between them. 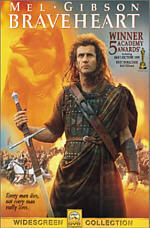 The rest of the movie follows Robin’s attempts to battle against Prince John. We watch as he amasses his gang of Merry Men. This clan includes his manservant Much (Herbert Mundin), Will Scarlet (Patric Knowles), John Little (Alan Hale), and Friar Tuck (Eugene Pallette). Eventually Robin and company even manage to capture Sir Guy and Marian when they pass near to the Sherwood Forest. He lets Guy go with a warning, but he romances Marian and brings her over to his side. Since Guy maintains a romantic interest in the Lady, this causes even more friction and makes things more personal. As with most action flicks, essentially the plot exists as little more than a framework onto which we get lots of fight sequences and lively set pieces. The characters do little to differentiate themselves from broad stereotypes, but that seems fine in this sort of movie as long as it delivers the goods. Happily, even 65 years after its creation, Adventures continues to impress in that regard. I won’t claim that Adventures hasn’t aged in that span, for it clearly has. Some of the acting comes across as rather broad and campy, and a few other elements suffer mildly from the distance of years. However, much of the film continues to work quite well and should still enthrall audiences. The action sequences definitely function best. These always come across as lively and exciting, and the film ramps up the action nicely as it progresses. Each subsequent bit outdoes the last, and this culminates in a truly thrilling climactic sword duel. Even if the rest of the movie stunk, the latter piece would make Adventures memorable. Adventures also merits attention because of how strongly it comes across as an archetypal action flick. Basically all of the components we still find in movies of that genre exist in Adventures. From the romantic interaction between Robin and Marian to the comic relief to the nature of the villains, not much seems to have changed since 1938. Adventures set up pretty much everything we still see in this sort of movie. And it worked better than most. Modern action flicks might be louder, more aggressive, and splashier, but not many of them live up to the standards set 65 years ago with The Adventures of Robin Hood. The movie created a model for the genre and continues to entertain and delight all these decades later. 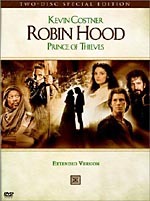 The Adventures of Robin Hood appears in an aspect ratio of 1.33:1 on this single-sided, double-layered DVD; due to those dimensions, the image has not been enhanced for 16X9 televisions. Despite a few small concerns, the movie mostly looked excellent and transcended it age-related origins. Some of the minor problems connected to sharpness. While most of the film appeared nicely distinct and detailed, occasional issues popped up in that domain. Some shots came across as moderately ill defined and soft. The concerns weren’t enormous, but they existed. No signs of jagged edges or shimmering showed up, though, and the movie also seemed to be free of edge enhancement. As for print flaws, Adventures mostly avoided them. Some light speckling occurred, and the occasional small blotch or blemish could be seen. At times, grain looked heavier than I expected. Nonetheless, given the flick’s age, these issues were quite unobtrusive. A Technicolor extravaganza, the film’s tones provided some of the transfer’s strongest elements. Skin tones looked a bit pink at times, but these concerns were easily overshadowed by the image’s positives. The movie enjoyed a broad and vivid palette, and the hues came across as vibrant and dynamic at all times. They really seemed splendid. Black levels were dense and deep, and low-light shots appeared appropriately concise and clear, though they tended to present the heaviest grain. Overall, I felt pretty impressed with the transfer of Adventures. The monaural soundtrack of The Adventures of Robin Hood also seemed very solid for its era. The audio came across as nicely smooth and distinct. Speech occasionally betrayed a little edginess, but that issue seemed much less noticeable than normal for a flick from this period. Dialogue was always intelligible and acceptably natural. Music presented reasonable range and seemed bright and relatively full. Effects appeared tight and accurate, and no distortion interfered with the audio. The track also seemed pleasantly free from defects like hiss, noise or crackling. Ultimately, the sound for Adventures appeared quite satisfying. This two-DVD release of The Adventures of Robin Hood comes equipped with a nice collection of extras. On the first disc, we begin with an audio commentary from film historian Rudy Behlmer. A veteran of many other similar tracks, Behlmer gives us a typically solid running, generally screen-specific discussion. Behlmer touches on many different topics. He talks about the history of the Robin Hood legend and the era in which the story takes place, many production details, and biographical information about its participants. He packs a lot of great information into the commentary in an efficient and entertaining manner. When you see Behlmer listed as a commentary participant, it’s pretty much money in the bank, as you’re essentially guaranteed that you’ll get a solid chat. Another audio track offers a music only presentation. The score comes via its original monaural mix. Fans of the music will surely love this extra. A creative and fun addition to the set, Warner Night at the Movies attempts to replicate the cinematic experience circa 1938. As explained via a two-minute and 40-second introduction from Leonard Maltin, this feature includes a preview for Angels With Dirty Faces, a flick from the same era as Adventures, plus a period newsreel, an animated short called Katnip Kollege and a live-action musical short entitled Freddie Rich and His Orchestra. These are the kinds of pieces that might have preceded a theatrical showing of Adventures, so if you activate this feature, you get an attempt to duplicate a night at the cinema. I like this program and think it’s quite clever. 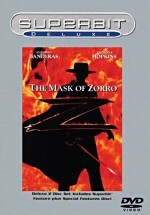 DVD One includes an Errol Flynn Trailer Gallery. This provides 12 promos for 11 Flynn flicks; it features a reissue ad for Adventures as well as the original clip. It’s a nice collection of trailers from a span of 18 years. The first disc concludes with two text pieces. Awards shows some honors given to Adventures, while Cast & Crew lists a variety of main participants. The latter provides no details about the folks; it just shows their names and jobs. DVD Two leads off with a documentary entitled Glorious Technicolor. Narrated by Angela Lansbury, this 60-minute program mixes archival materials, movie clips, and contemporary interviews with actors Esther Williams, Arlene Dahl, Evelyn Keyes, Kim Hunter, and Jerry Maren, cinematographers John Alton, Jack Cardiff, Vittorio Storaro, and Oswald Morris, Cammie King Conlon, the stepdaughter of Technicolor pioneer Herbert Kalmus, Technicolor research scientist 1953-1965 Dr. Richard J. Goldberg, UCLA Film and TV Archive preservationist Robert Gott, author Fred Basten, Daniel Selznick, the son of film mogul David O. Selznick, MGM makeup artist 1936-69 William Tuttle, Vincente Minelli’s collaborator and friend Tony DuQuette, and editor Thelma Schoonmaker-Powell. “Glorious” offers a solid examination of Technicolor and its history. We get notes about early attempts at color films and see how pioneer Herbert Kalmus became involved. We then watch as the company grows and his ex-wife Natalie runs things with an iron hand. We also find many examples of prominent uses of Technicolor and view a lot of great movie clips. “Glorious” tells its tale well and educates us on Technicolor in a brisk and interesting manner. After this we get a new documentary called Welcome to Sherwood: The Story of The Adventures of Robin Hood. In this 55-minute and 40-second program, we find movie clips, archival materials, and interviews with Behlmer, Maltin, literary historian Paula Sigman, film historians Bob Thomas and Robert Osborne, swordmaster Bob Anderson, WB art director Gene Allen, and Hollywood Bowl Orchestra conductor John Mauceri. They go through the history of the Robin Hood legend and then really dig into the movie itself. We learn how it got to the screen, casting, the state of Warner at the time, and all the significant production elements from script to stunts to score. It repeats a fair amount of material from Behlmer’s commentary, but given the completeness of his discussion, that became inevitable. “Sherwood” provides a fine recap of the production and serves as a good examination of the film. In the Looney Tunes domain, we get two vintage animated shorts related to the Robin Hood legend. We find 1949’s “Rabbit Hood” and 1958’s “Robin Hood Daffy”. The first stars Bugs Bunny and is easily the superior of the pair. It even tosses in a pseudo-“cameo” from Adventures! Up next we locate two Short Films. “Cavalcade of Archery” showcases bowman Howard Hill and runs nine minutes, 23 seconds including an introduction from Behlmer. “The Cruise of the Zaca” details boating expeditions that feature Errol Flynn; also along with an intro from the omnipresent Behlmer, it fills 19 minutes and 54 seconds. Neither seems terribly stimulating, but they offer moderately intriguing historical curiosities. An examination of different movies comes up in Robin Hood Through the Ages. Actually, this Rudy Behlmer-led discussion focuses almost entirely on 1922’s version from Douglas Fairbanks. We get a couple of notes about earlier ventures, but then Behlmer takes us through scenes from the Fairbanks edition and compares them to elements of Adventures. This six-minute and 50-second program gives us a nice look at that flick, but it could – and should – have been more all encompassing. Once again, Rudy Behlmer brings us A Journey to Sherwood Forest. He narrates this 13-minute and 17-second compilation of behind the scenes footage shot during the production of Adventures. Behlmer tells us who’s who and gives us some basic notes as we watch this fairly mundane material. Still, though the clips don’t seem terribly compelling on their own, the rareness of this sort of footage makes it more interesting. From the Cutting Room breaks into two subjects. “Outtakes” provides eight minutes and 23 seconds of unused footage. Introduced and narrated by Rudy Behlmer, we get details about the clips as we watch them. It’s a fun look behind the scenes at some raw material. A long blooper reel, “Breakdowns of 1938” runs 14 minutes and 20 seconds as it showcases goofs from all sorts of Warner productions from that year, most of which provoke spasms of profanity from the actors. These flubs were just as lame then as they are now and the sameness of the mistakes makes the piece tedious, but I must admit it’s very intriguing to see performers like Humphrey Bogart and Bette Davis screw up, especially when it results in an outburst. In the Audio Vault, we find two elements. First we discover the National Radio Broadcast of the “Robin Hood Radio Show” from May 11, 1938. This offers the airing of Korngold’s score accompanied by narration from Basil Rathbone. “Piano Session” with Erich Wolfgang Korngold comes without any explanation, but it seems to be a small concert given by the composer. He runs through tunes from a number of his flicks, and that includes a little from Adventures. Neither of these extras does much for me, but as with the isolated score, fans of movie music should really like them. Finally, Adventures provides collections of stills in an area called Splitting the Arrow Galleries. This domain breaks down into five sections: “Historical Art” (21 frames), “Costume Design” (39), “Scene Concept Drawings” (20), “Cast & Crew” (31), and “Publicity & Posters” (16). Nothing spectacular shows up here, but it’s a good series of images nonetheless. 65 years down the road, The Adventures of Robin Hood remains a fine film. Not only do we see its influence on later flicks, but also it still seems exciting and entertaining. The DVD presents very good picture and sound along with an excellent set of supplements. An enjoyable and likable action picture, I definitely recommend Adventures.